To long-time F1 fan Sean Mills, making figures to add extra detail to his model cars was the start of something special. Since then he’s gone on to produce collectable figurines of F1 greats including Ayrton Senna, Michael Schumacher and Alain Prost. And now he’s turned his attention to the latest member of the exclusive F1 world championship winners’ club. Sean has recently produced a limited-edition figurine to celebrate Lewis Hamilton’s historic 2008 dvictory, reproducing the youngest-ever winner in 1/12th scale – that’s about six inches, or 15 centimetres, high to you and me. When he got in touch to tell us about it, we couldn’t resist the opportunity to find out a little bit more about how he makes and paints them. And to share the results on the site, naturally. What inspired you to get involved with making racing figurines? Being a model maker (sculptor), making models for F1 enthusiasts, etc. There was nothing available other than the cars they drove, and always wanting to add extra detail to my models, a figurine to go with the cars for me made sense. Tell us about some of the modelling work you’ve done in the past. In the early nineties I wrote a column for F1 news magazine doing enthusiasts’ information and helping to improve F1 model kits. I produced many commissions for collectors and show pieces around the world, as for the figurines I produced: Ayrton Senna, Alain Prost, Damon Hill and Michael Schumacher. Your website mentions that you worked with the Senna Foundation, which sounds like a really interesting organisation, providing development opportunities for children and young people in Brazil. Could you tell us a little more about that? Do you work in any other areas of modelling, apart from producing figurines? At the moment, no. Apart from the occasional commission, I don’t have the time, as I’m working on the new figurines. But I do intend to produce a range of F1-related models next year. What with the HANS, the helmet styling and the sponsorship patches, you’ve had a fair bit of detail to capture on the Hamilton figurine. Does producing this kind of model provide particular challenges? Yes, many. A company in the UK makes a cast and produces the figurines for me, and this is the only part of the procedure which is not in-house. All painting decals are done in-house. I design and size all logos with the help of Kevin Canales, a web designer. The biggest challenge is the decals though, they have to be realistic, this is tricky, and has come with many years of experience. Is it a very time-consuming process? What kind of research do you typically need to do? Research today is much easier that it was in the past, thanks to the internet, most information can be located this way. Working in only 1/12 scale I have to produce each driver correctly i.e. height etc. as for the sculpting I work from photos. Tell us a little bit about your methods and materials – the bits that aren’t trade secrets, that is! To sculpt in this scale I use a product called Magic Sculp, a resin-based product. As for the figurines, they are cast in cold cast resin and painted in acrylic. To sculpt one of my figures takes me about three weeks, sometimes longer, and my biggest critics are my family; it has to be perfect to get their approval. What should collectors look for when buying this kind of item? Have you any other advice? Make sure it’s one of mine! (Only joking.) Seriously, it’s the same with a painting: check limited edition, the fewer the better. I’m an enthusiast in the area, not out there for profit only, and I can always be contacted by the collector. My figurines are not cheap, but you are guaranteed it is a collectable item, and will only increase in value. 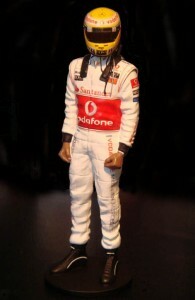 Recently I have seen the Ayrton Senna figurine selling for double the original price. Do you have any future projects in mind? Could you see yourself being moved to make, for instance, a Sebastian Vettel figurine if he should nick Hamilton’s ‘youngest champion’ record? Yes, next week you will be able to see my new Fernando Alonso figurine, and it will be available to see on my website, to follow will be Schumacher and Senna, as for Vettel if there’s interest then yes, I would. Yes, I live on the Golden Mile Marbella. Mmm, this is a tricky one, firstly I’ve found all of this a bit strange. As a long-time F1 fan, nationality of drivers was never the reason behind your favorite driver, unlike other sports it was always a personal choice for the real enthusiasts, nothing else. Alonso does not drive for McLaren because of Hamilton’s arrival, which is the general consensus out here. I think that once Alonso is in an equally competitive car, fighting for the championship again, Hamilton’s popularity may improve.  You can find out more about Sean’s current and future figurines by visiting his website: http://www.seanmillsfigurines.com/ All the pictures reproduced here belong to him – so please don’t use them without asking him first. since i started back making f1 figurines etc. 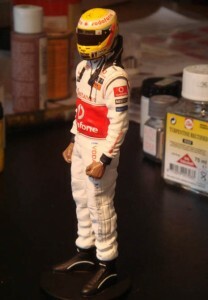 starting with Lewis hamilton we currently make over 30 different f1 1/12scale drivers selling all over the world. 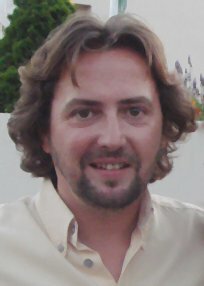 Its been a fantastic first year,working every day since may i totally missed the summer out here in marbella. My model making service is also available with the Ascari Race Resort. thankyou for the article you did. Categorised under F1, tagged under F1 collectables, Formula One, Lewis Hamilton, McLaren.